In GURPS Discworld, gamers visited the strange and wonderful setting of Terry Pratchett's best-selling novels. Everyone had such a good time that we've booked a second trip! 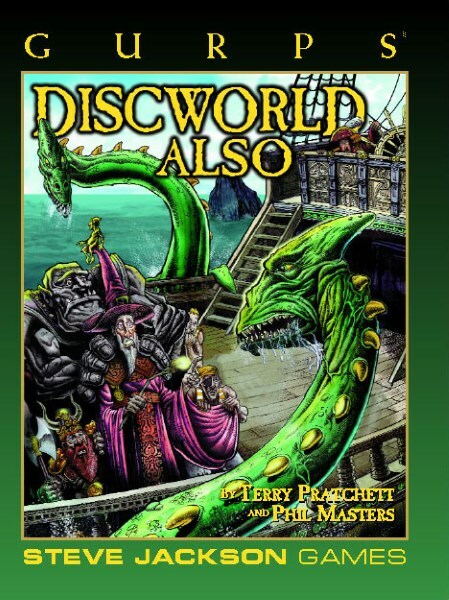 Our guide for GURPS Discworld Also will again be Phil Masters; he promises that the Dungeon Dimensions are not on the itinerary, and Mr Dibbler's meat pies are not on the menu. You will, however, visit the Lost Continent of XXXX (and its Cart Wars), meet the Hermit Elephants and a very big troll, and go on a mission for Unseen University to find out why the Librarian's supply of bananas has dried up .